Handling and transportation procedures must maintain the viability of the specimen. Specimen integrity is the composite product of anticoagulant, storage conditions (time and temperature), and sample preparation procedure (5,7). • If blood is hemolyzed or frozen, the specimen should not be analyzed. 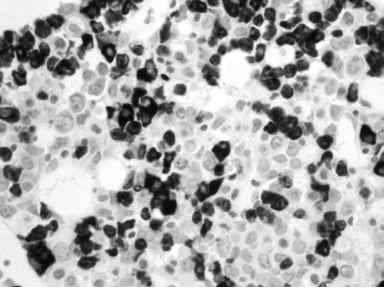 Hemolysis indicates that the blood was exposed to conditions that can cause erythrocyte lysis, which suggests that leukocytes may also be damaged. • If clots are visible, the specimen should not be analyzed. Even a partial clot may cause selective loss or alteration of certain subpopulations. • For some anticoagulants (i.e., ACD), a partially filled tube may produce hypertonic conditions that are deleterious to cells, especially if they are fragile neoplastic cells. Depending on the magnitude of the overfill, one may accept or reject the specimen. 1. Phosphate-buffered saline (PBS): 5.68 g sodium phosphate dibasic (0.01 M), 35.48 g sodium chloride (0.15 M), 2.8 g bovine albumin, 4.0 g sodium azide, Q.S. to 4 L with deionized water, pH to 7.4. Store at 2-8°C, stable for 1 yr.
2. Lysing agent: 33.04 g ammonium chloride, 4.0 g potassium bicarbonate, 0.148 g tetrasodium EDTA, Quantity Sufficient (Q.S.) with distilled water to 4 L, pH 7.2-7.4. Stable for 1 yr.
3. Flow sheath fluid: obtain from Becton Dickinson, Bioscience, San Jose, CA. Store at room temperature, stable for 1 yr.
4. Rabbit serum (nonimmunized). Store at 2-8°C. 5. RPMI Medium 1640 (Gibco Laboratories, cat. no. 380-6140AG). Store at 2-8°C, stable for 1 yr.
6. MAb (specific to leukemia/lymphoma panel). See Table 1. 7. Ficoll hypaque. Long-term storage at 2-8°C. Bring to room temperature prior to use. Stability is based on the manufacturer's recommendation. 8. Propidium iodide (PI) solution: 0.125 g PI and 250 mL flow PBS. Cover with aluminum foil. Store at 4°C; stable for 2 mo. 11. Antibodies (see Table 1).